Vladimir Sokolov was born in Komi Republic, Northern Russia. In 1954 he graduated from the School of Music there and in 1959 from the Moscow Conservatoire where he studied under the tutorship of Professor A. Semenov and after his death - Professor A.Volodin. 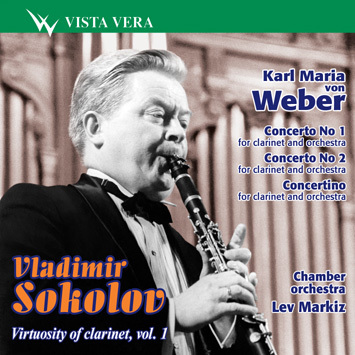 Immediately after graduating from the Conservatoire Sokolov worked as a trainee with the USSR State Symphony Orchestra where a celebrated conductor Nikolai Anosov took notice of and marked out a young musician. For several years Sokolov worked with the All-Union Radio Symphony Orchestra. In 1963 he won the first prize at the All-Union competition in Leningrad. In the same year he becomes soloist of the USSR State Symphony Orchestra. Since 1973 teaches at the Moscow Conservatoire, since 1993 - Professor of the Conservatoire. Received the title of the People's Artist of Russia in 1984. Vladimir Sokolov died untimely in 1999. This disc is a tribute to his memory.